“Many people don’t realize that programs like WIC and SNAP do not pay for diapers, rash creams or other infant supplies. Diapers are an essential and often overlooked need for families struggling financially around the holidays,” said Rep. Ryan Spain (R-Peoria) on Friday. 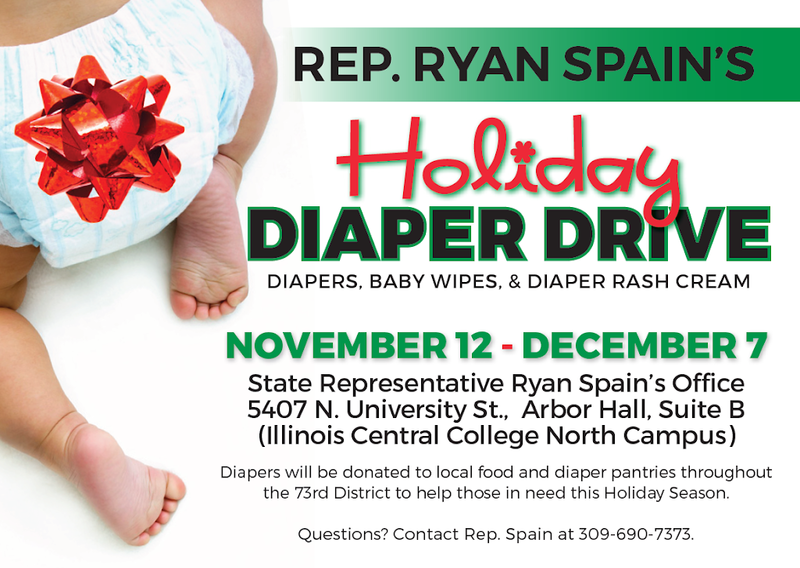 Recognizing this significant need in the community, State Representative Ryan Spain (R-Peoria) announced on Friday that he will again be hosting a Holiday Diaper Drive beginning Monday to address the insufficient supply of diapers to keep infants in need clean, dry, and healthy. The Holiday Diaper Drive will run from November 12 through December 7. Donors may drop off unopened packages of diapers (all infant and toddler sizes and brands welcome), baby wipes, and diaper rash cream to State Representative Ryan Spain’s Peoria District Office (located at Illinois Central College North Campus, Arbor Hall, Suite B, 5407 N. University St., Peoria). Diapers will be donated to local food pantries and diaper pantries throughout the 73rd Legislative District to help those in need this Holiday Season. Children under the age of 5 comprise 13 percent of the State’s SNAP recipients and more than 25% of WIC recipients are infants. Diapers cost an average of $18 per week or $936 per year. According to the National Diaper Bank Network, low-income families report a shortage of 50 diapers per month. Donations to Rep. Spain Holiday Diaper Drive are encouraged through December 7 in order to get the diapers to pantries and to families before the holidays.